As of 2018, Historic Denver continues to serve on the National Western Citizen Advisory Committee, and provides active guidance and advocacy for the site’s historic buildings and cultural heritage through the Campus Placemaking process. Our advocacy for these resources began in 2011 and we’ve succeeded in protecting numerous buildings, including the now landmarked 1909 Stadium Arena. 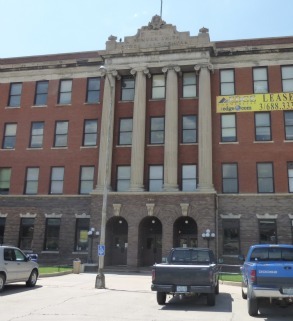 other buildings to be reused include the Livestock Exchange and the Stock Show Association Building, as well as some of its neighbors on National Western Drive. 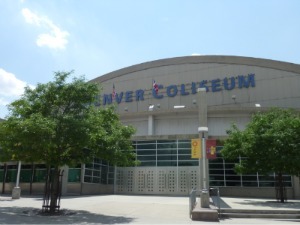 The Denver Coliseum also remains and is one of the key historic resources on site having turned 50 in 2016, although there is less certainty regarding its long-term reuse. Throughout the conversation Historic Denver has worked to provide historical background about the National Western’s history and site, and we hope to continue to inform the decision-making process, as the history and historic fabric is one of the National Western’s key assets. 4701 Brighton Boulevard was constructed in 1906 and served as in important hub of activity and cultural for the Elyria Neighborhood for more than a century and sits on the eastern edge of the Stock Show site. The former grocery was slated for demolition as part of the Brighton Boulevard project, but through our efforts and the assistance of History Colorado and the National Western Center we were able to develop and implement a creative solution by carefully documenting the entire structure, dismantling it piece by piece, and storing it nearby so that it can be reconstructed near its original location as the site’s plans unfold. 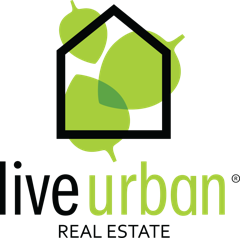 We believe it can become a human-scaled anchor on the eastern side of the Stock Show campus, and serve as a link to the neighborhoods nearby. In 2011 news about the possible move of the National Western Stock Show from its historic location, created a lot of dialogue and many questions. Prompting the concern of many is the Stock Show’s long legacy in Denver, its association with the 19th century stock yards and its 105 year tenure in its current location just north of 1-70 and close to the railroad tracks that once transported hundreds of thousands of animals to and from sales and auctions. At the time there were many questions about whether the Stock Show’s legacy could survive a move, what would happen to the institution if it loses its sense of place, the loss to Denver’s identity, and of course, what would happen to the Stock Show site itself, and the dozens of associated buildings, if the National Western left? Then, in 2012 Mayor Hancock and the National Western announced that they decided against a move, and will remain at their historic location north of 1-70. The Stock Show, the City, and community partners then developed a new vision and plan to make the Stock Show a year-round endeavor. Historic Denver is part of the National Western Center Citizen’ Advisory Committee, launched in October 2013. While it’s difficult to pinpoint the exact beginnings of the National Western legacy, it’s clear its roots lie with the Stock Yards themselves and Denver’s early and enduring role as a “cow town.” This connection is evidenced by the oldest structure on the site, the center section of the Livestock Exchange Building, completed in 1898. Facing the railroad tracks and originally surrounded by cattle pens this building is at the heart of the Stock Show site and two subsequent additions, one in 1916 and one in 1919, make it a striking property. By 1900 the cattle pens and land around the Livestock Exchange handled 239,000 cattle, 115,700 hogs, 306,109 sheep and 22,700 horses. Original 1898 section of the Livestock Exchange Buidling, surrounded by cattle pens. Photo Credit: Western History Department, Denver Public Library. The five-story 1916 portion, which is the most recognized and prominent, was constructed by the general contracting firm of Allison Stocker and John H. G. Fraser for one million dollars. The building housed the offices of the Denver Union Stock Show Company, the first force behind the National Western Stock Show. The building also housed the Denver Daily Record-Stockman newspaper, a restaurant, a cigar store, the Stockyards National Bank, the Colorado State Farm Bureau, and the local office of the U.S. Bureau of Agricultural Economics. Today the building is privately owned and remains in good condition, with amazing intact interior details. As the Livestock Exchange Building evolved so did the Stock Show itself. The first show, known as the Western Livestock Show opened on January 26, 1906 under a circus big top. In 1907 and 1908 the show was held under a “monster” 150 x 175 foot tent. It was not until 1909, after the completion of the National Amphitheater, that the show was held in a proper structure. The National Amphitheater and Livestock Pavilion, today known as the Arena, was built in eight months and completed in time for the show on January 18, 1909. The building was a massive structure for the time, measuring 250 x 350 feet and seating 6,000. The interior columns are steel, as are the long girders spanning the 90 x 250 feet open arena. The walls are made of brick with massive steel pilasters that are four feet thick. This all rests on a huge concrete pad foundation and supports a wooden arched roof. In 1909 green tanbark (shredded bark similar to mulch) covered the floor and the arena, which was lit with large flaming arc lamps and skylights. The original Arena was steam-heated and had stalls for livestock under the seats. The Arena was designed in neoclassical style with pedimented entries framed by twin towers. Flagpoles were built on top of the pilasters to fly the 12 flags of the Rocky Mountain States. 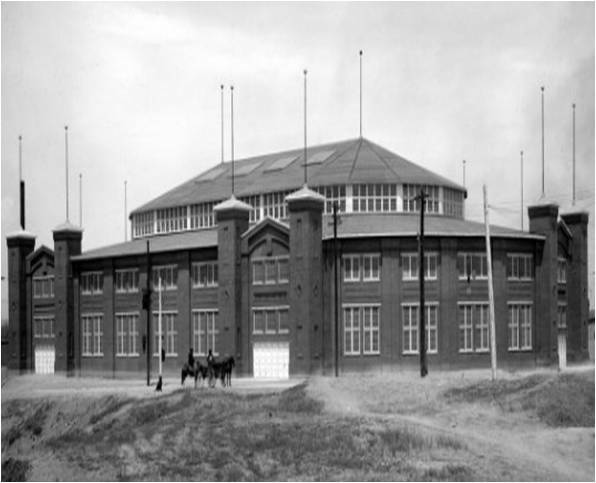 The arena cost $200,000 to build in 1908 and was paid for by a consolidation of Swift, Armour, and other packers that operated the Denver stockyards. Over the years additions and alterations have been made to the structure that somewhat obscure its original exterior appearance. The Arena is owned by the Stock Show. In 1945 the National Western Stock Show began campaigning for a new stadium. They decided to team up with the City of Denver and build a stadium that could be used for large events, such as basketball, ice hockey and track meets, not just the stock show. In 1947 a $1.5 million bond was passed by the city voters to build a “Municipal Coliseum.” The National Western Stock Show, the Denver Union Stock Yard Company, and other livestock interests raised another $750,000 toward the construction project. Fortunately, the land was donated by the Colorado and Southern Railroad. 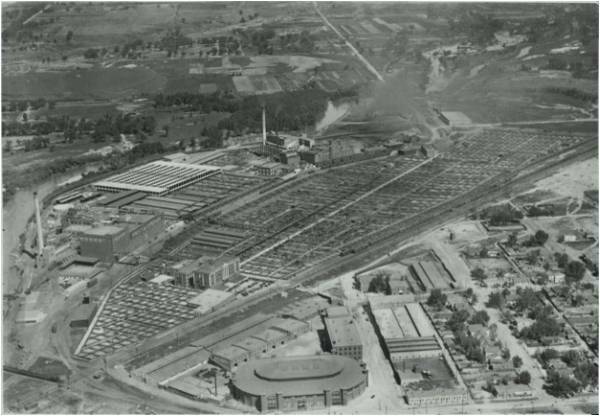 Interestingly, the previous occupant was the Grant Smelter, which was demolished in front of a crowd of 100,000 in the 1950s. Work began on the Coliseum on September 19, 1949 and it was dedicated on January 10, 1952. The New York and Chicago-based architectural engineering firm of Lorimer and Rose worked on the new stadium with consulting Denver architect Roland L. Linder. Linder worked with Eugene Groves from 1921 to 1929 and then Allied Architects from 1929 to 1931. Linder supervised the completion of the City and County Building in Denver as part of Allied Architects. From 1931 to 1951 Linder had his own architectural firm and designed the Loveland Community Building (1937), the Fort Collins Library (1938), the Denver Museum of Natural History Auditorium (1939), and the wings of the Museum of Natural History (1948). Linder’s clean, smooth lines can be seen in the modern design on the Coliseum. When the Coliseum was built it was a state of the art building constructed with steel reinforced concrete. Construction of the building used 100,000 sacks of cement, 1,200 tons of reinforced steel and 575,000 feet of lumber. To allow an unobstructed view from the 8,006 permanent seats, the ceiling was built with six huge arches and no pillars for support. This concrete roof weighs more than 5400 tons. In total the building measures 306 feet x 400 feet and has an 87 foot high ceiling. The structure was completed before the construction of 1-70 and was easily connected to the older Stadium Arena. After the highway and viaducts were built in the 1960s this connection became more challenging. Today the Coliseum is still owned by the City of Denver. Perhaps the most quintessential structures on the Stock Show site are not buildings at all, but the cattle pens, or stockyards, which existed even before the National Western Stock Show. The official stockyards, owned by the Denver Union Stock Yard Company, opened in 1886. These yards were located between the South Platte River and the railroad tracks and Franklin Street, bounded by 46th Avenue on the south and 52nd avenue on the north. By 1905 the stockyards covered 105 acres and handled 239,500 cattle, 115,700 hogs, 306,109 sheep, and 22,700 horses and mules a year. 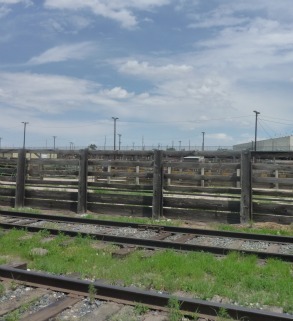 Today the National Western owns most of the old Denver Union Stock Yard Company’s open yards and stock pens. Stock Show & approximately 105 acres of Denver Union Stock Yards circa 1940. Arena can be seen in the lower center. Photo Credit: Western History Department, Denver Public Library. 1859 Elephant Corral in LoDo used for livestock shows and auctions. 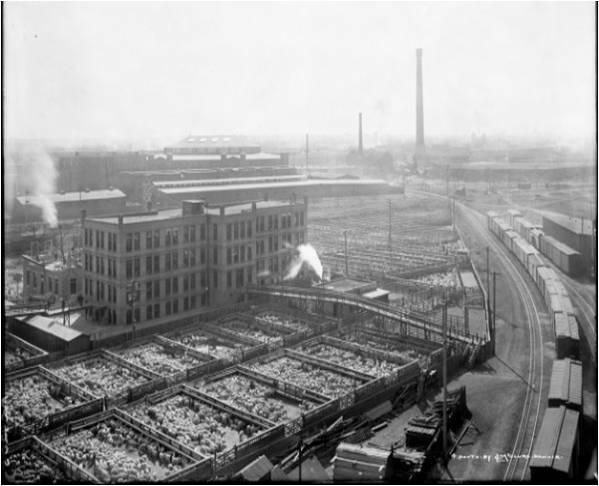 1881 Denver Union Stockyard Company founded. 1886 Stockyards open in current location. 1898 National Stock Growers Association created at first major stock convention, which ended in a near riot because of the free beer provided on the final day. 1898 Oldest section of what is now the Livestock Exchange Building constructed for the Denver Union Stockyard Company. 1906 First Stock Show opened under a circus big top and the Western Stock Show Association created. 1907 A “monster” 150 x 175 foot tent was manufactured by a local awning company as the venue for the next two Western Stock Shows. 1909 The newly constructed 6,000 seat National Amphitheater (Arena) opened. 1911 Two and three story barns and a club building constructed. 1916 The elegant east portion of the Livestock Exchange Building opened. 1919 The western section of the Livestock Exchange Building opened. 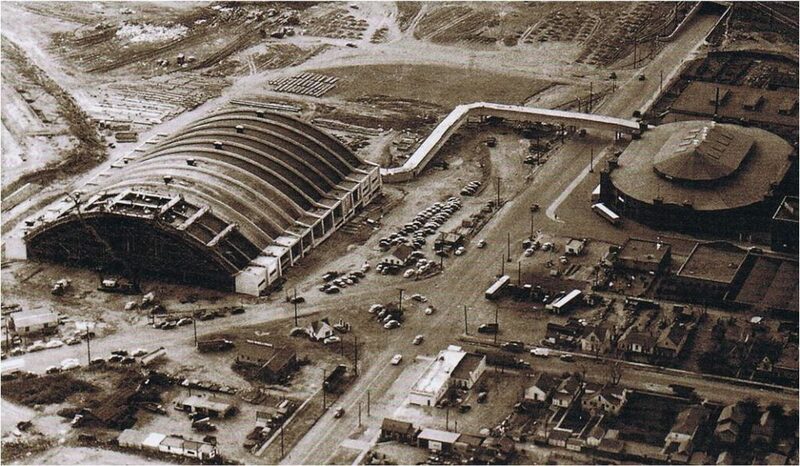 1942 The WPA constructed a huge concrete barn on the facility and a Quonset hut was installed next to the barn. 1952 The Denver Coliseum was dedicated on January 10 for the 46th National Western. 1962 The Denver Union Stock Yard Company built an auction arena in the yards. 1973 The two-level 300 x 390 foot Hall of Education was opened to the public. The Beef Palace, Horse Center, and National Western Club also opened. 1987 The International Center opened. 1991 The Expo Hall and Stadium Hall opened. 1995 The National Western Events Center, a state-of-the-art equestrian arena with a 150 x 300 foot floor opened, and the Paddock and Horse Barn completed. The CDOT study identified a handful of buildings associated with the National Western Stock Show as eligible for listing as part of a historic district. Many of the buildings identified are not owned by the Stock Show and are now held by private owners. Listing on the National Register cannot occur without the consent of these owners. However, the study does provide some helpful information about the oldest buildings associated with the Stockyards and the Stock Show. 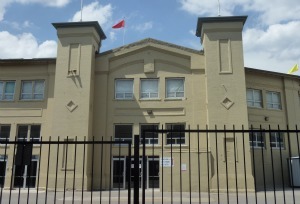 While historic designation is not the only tool available to owners of older buildings, designation could perhaps create some new opportunities for the Stock Show site as National Register listing makes a structure eligible for significant federal tax incentives that can help off-set the costs of rehabilitation. This strategy has been used very successfully in Denver in Lower Downtown and in the redevelopment of the Lowry Airforce Base. Designation and tax credits were also successfully employed in the redevelopment of the Fort Worth Stockyards which are now a major tourist attraction and an economic success story. It is important to further clarify that National Register listing does not impact an owner’s ability to remodel or even demolish a structure. Local landmark designation, for which there is a more stringent set of criteria and which requires a public hearing and formal vote by Denver City Council, can prohibit demolition. National Register designation and local landmark designation are two totally separate processes. For over a year the city of Denver, through the office of Community Planning & Development, has been working with the neighbors in the Swansea/Elyria Neighborhood to create a new neighborhood plan that includes the addition of new light rail stations. READ THE FINAL DOCUMENT HERE. Please visit the City and County of Denver webpage with additional information and links, HERE. The Fort Worth Stockyards, once the home to their Stock Show, were converted into a tourist destination in the 1970s using preservation and accompanying tax credits. Read more about their facility HERE. 1909 Stadium Arena Fact Sheet from the City of Denver. Click HERE.